Kommaly Chanthavong from the sustainable business,"Mulberries" in remote northern Laos demonstrated the technique of reelingsilk from cocoons in boiling water to strands of fine silk. Lao women have been synonymous with weaving for centuries and weaving is an important part of a woman’s daily life. Lao mothers have passed their silk reeling and weaving skills onto their daughters. Rather than receive formal education, young girls were taught to plant mulberry trees, reel, raise silk worms and produce natural dyes, weave silk thread, embroider and spin cotton thread. Cloth patterns going back thousands of years are still used and adapted. Each has a different meaning or interpretation and is varied by colours and personal ideas and taste. After years of war and diplomatic isolation, Lao is slowly moving towards regional integration. However, it faces serious challenges of poverty and food security, especially among the subsistence farming communities which form the bulk of the population. Unexploded ordinance casualties, particularly among children who scavenge the metal for recycling, occur frequently. Lao youth and ethnic minority women are trafficked, particularly to Thailand for sexual and financial exploitation. Employment for women, especially in the villages and outside main commercial areas, is limited. One way for women to remain in the villages is to use their weaving knowledge and skills to produce lengths of fabrics – especially scarves – for sale to tourists and to an international export market. In 1976 Kommaly Chanthavong, who had learnt weaving from her mother as a child, invited a small group of weavers to form the Phontong Weavers. The group functioned as a simple cooperative by sharing what they had and what they made. Old looms, technical knowledge, money and time were all donated to the group and the resulting products sold in Morning Market in Vientiane, the capital of Lao. 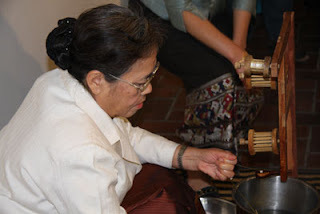 “I learned the traditional techniques of Lao weaving and the use of natural dyes practiced in my home town in a northern, mountainous province in Laos. The town is known for its complex supplementary and non-supplementary weaving and its wooden straddled handlooms,” Kommaly said. In 1977 the success of the group caught the Government’s eye and they were asked to weaver the numerous ribbons needed for uniforms for officers, soldiers and police officers. The additional business enabled the weavers to expand their operation and they began working in the villages around Vientiane. In 1985 the group became legally incorporated as the Phontong Handicraft Cooperative and is the only surviving self-sustaining handicraft cooperative in Laos today. Kommaly was elected as director and has created legal structures around the group that are economically sustainable as non-profit handicraft projects. Through Lao Sericulture many villagers are employed undertaking different steps of the production of silk worms through to designing and weaving scarves. Farmers raise cattle and use the manure to fertilise the plants. Cuttings from the mulberry trees are transplanted in the fields and watered twice daily for three to six months. The silk worms are fed three times a day and kept in sanitary conditions in the rearing house for 28 to 30 days of the silkworm cycle until the time when they begin to spin their cocoons. Natural dyeing is also a labour intensive, traditional art, using locally available resources and expertise. Plants are used for dyeing, and other plants attract insects. The nests and by-products of the insects are gathered and used to create dyes. “Lao silk worms produce a finer, more delicate fibre than Thai or Chinese silk worms. However, I have developed a hybrid worm that gives a thicker, stronger fibre. I have also developed a special piece of equipment to combine reeling and spinning the silk to be done in one process rather than two separate steps,” Kommaly said. Reeling is the term for separating the raw silk fibre from the cocoon, using a pampas whisk, which is then spun onto a winder. The golden coloured cocoons bob around in boiling water until they are picked up for reeling. Kommaly was nominated among 1000 women for the Nobel Peace Prize in 2005 for artistic excellence and her contribution in strengthening the social and economic position of Lao women and their families. In February this year her exhibition and display at Melbourne’s 2008 Sustainable Living Festival received considerable interest from the Australian public. During the Tapestry Symposium at the ANU School of Art beginning on Friday, Kommaly will be selling work from the Lao Sericulture Company under the Mulberries Label. The works will include indigo blue silks, naturally dyed lengths of fabric with supplementary weft – rich, colourful designs that are very similar to embroidery – which could be used as fabric hangings or decorative items. She will also have a range of contemporary designs in scarves and wraps. All will use Lao motifs and patterns. To celebrate World Environment Day 2008, the Powerhouse Museum in Sydney will present an illustrated talk on "Sustainable Traditions from silk farming to Lao textiles" with Kommaly Chanthavong, Lao Master Weaver and her daughter Boby Vosinthavong on Wednesday 4 June from 12.30-1.30pm and Sunday 8 June from 2.00-3.00pm. This talk is part of the Powerhouse Museum 2008 Adult Learning Program and will be free with museum admission.